UPDATE: Police Thought Raffling Off A Puppy Was A Good Idea. They Were SO Wrong. 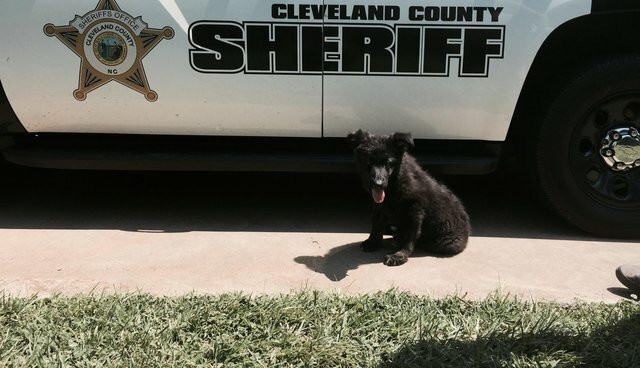 UPDATE: The Cleveland County, North Carolina Sheriff's Office has canceled the controversial puppy raffle due to "negative feedback," according to local news reports. A sheriff's office posted an adorable photo of a puppy to its Facebook page on Tuesday. It seemed harmless enough. But when people read the caption, the outrage began pouring in. "Here is the K-9 (German Shepard) we will be selling tickets for at the fair this year. Tickets are $1 and we will raffle off last day of fair. A 10X10 kennel and dog house will come with the puppy," the post read. "We will also be selling t-shirts and sweaters." Literally thousands of comments on the post followed. "This is horrific. A dog is a lifetime commitment, not a spur of the moment raffle ticket purchase. Please stop this, and rehome the puppy using a reliable organisation, one that will inspect the new home and ensure they have the means and the will to care for the puppy properly," one commenter wrote. Some questioned whether this was actually a joke: "ARE YOU KIDDING??? Why not raffle a small child? You are assuming the the raffle winner will provide a good loving home," wrote another. Others begged them think about the potential consequences of the raffle: "Wow, this is truly an irresponsible decision lacking common sense! This poor baby could end up in the wrong hands. A dog is a living breathing creature who will need a lifetime of care, not an object to be sold like a slave to the highest bidder." And others simply appealed to reason: "Please reconsider this decision. Your job is to serve and protect....this includes precious animals." The Cleveland County Sheriff's Office did not immediately reply to The Dodo's request for comment. One thing's for sure. The department seriously underestimated people's love for animals - and they failed to notice that treating animals as objects is becoming more and more repugnant to the general public. A dog is simply not in the same league as a T-shirt or sweater.